Flip round to landscape mode and you'll find a groove running along the front edge of the inside of the cover that can then house the bottom edge of the tablet. This is a great 'tent' style mode for watching movies or making use of a Bluetooth keyboard. But here's the interesting bit. 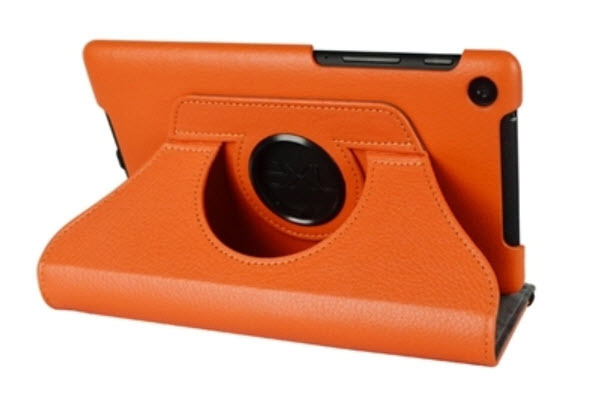 The 360° part of the case's name stems from the rotatability of the portion that holds your tablet in place. It can rotate through a full 360°, but really it's just to allow you to switch between a hands-free portrait and landscape mode. The angle is a little shallow when flipped to the vertical position, but it is still more than usable. The case feels robust and, aside from access to buttons and speakers, there are few exposed parts that could get scratched or damaged. I'm not sure how much rotating the case will stand for months or years to come, but the rotator cuff, including its off two-inch hole that makes it look as though it has been blasted at close range with a firearm, is certainly a weak point.